Two turkeys are thankful today for President Barack Obama today, as the commander-in-chief officially pardoned them during a ceremony in the White House Rose Garden. The official presidential pardon spares them from the dinner table. The two lucky birds, Apple and Cider, were flown from California for the Thanksgiving tradition. 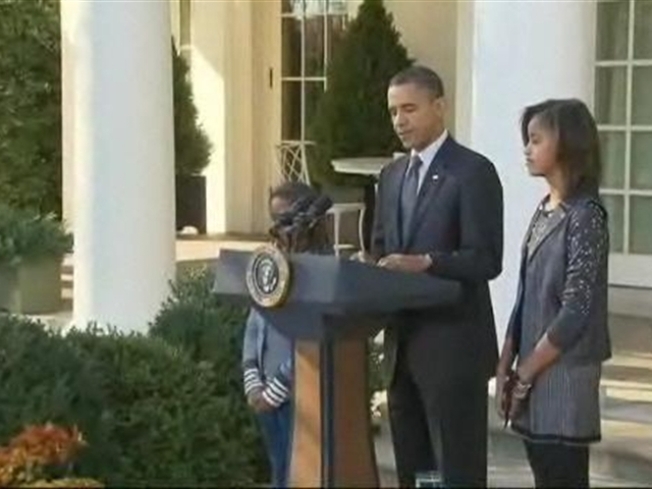 With daughters Malia and Sasha at his side, Obama cracked jokes about the competition that brought the turkeys to his famous doorstep. “For the record, let me say that it feels pretty good to stop at least one shellacking this November,” Obama said, in reference to the “shellacking” Democrats suffered in elections earlier this month, as the party lost control of the House and saw its Senate majority trimmed by six seats. Apple and Cider, two 21-week-old, 45-pound turkeys raised on a farm outside Modesto, Calif., were plucked from a group of 25 birds during a competition “that involved strutting their stuff before a panel of judges, with an eclectic mix of music playing in the background,” Obama said. He called it a “turkey version” of “Dancing with the Stars,” the program that crowned its newest winner Tuesday night, the Associated Press reported. The president wished America's families, including many buffeted by the economic slump, a safe and happy holiday. He also thanked the men and women of the U.S. military for serving “bravely and selflessly” in places far away from home. Before getting pardoned, the turkeys enjoyed a relaxing Tuesday at the W Hotel, snacking on acorns, berries and corn. The birds are bound for George Washington's Mount Vernon estate, where they'll live out the rest of their days in peace. For the past five years, the pardoned turkeys had been sent to Disneyland in California, upsetting animal rights activists. 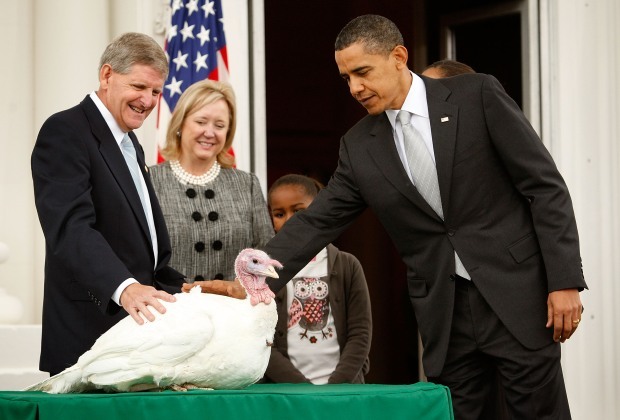 The White House tradition of turkey pardons, meanwhile, is more than six decades old, the AP reported. The National Turkey Federation said occasional pardons date to the time of President Abraham Lincoln. The modern tradition began in 1947, when President Harry S. Truman accepted a Thanksgiving bird from the organization.